Camping with kids is not so common in the Philippines, but it isn't so rare either. So far, I've only encountered seasoned climbers bring their kids hiking. Some tag their dogs along. Taking my son, Hann, outdoors as soon as he's fit to amble through irregular terrain has always been the plan. But adventure came sooner when I bought a backpack carrier. 1. It's the highest peak in Cebu, but the easiest to climb (as short as a 30-minute trek). 2. It has both the easiest trail (backtrail) and the hardest trail (traverse) in Cebu. An easy climb doesn't call for early risers. Oh yeah, we were so relaxed that packing didn't happen until an hour before our departure. As if we haven't pushed our initial schedule 2 hours behind, we arrive at our rendezvous place fashionably late (so Pinoy). At Caltex in Colon, we wait for the rest of our small group, who came about an hour even later than us. Anyway, it's a short trek and we didn't want to spend high noon at the campsite, so everything's good. Our unscheduled bus left once the driver deemed that all four corners of his coach are fully loaded. We journeyed down south to Dalaguete. A slight drizzle greeted us when we arrived at the vegetable basket town that is Mantalongon. We pick up a few items from the public market and start trekking from there. A few metrers in, we change our plans. I mean, we got kids in tow, so we make an excuse to totally stretch our 'jumpoff point'. We took a habal-habal motorbike to the last waiting shed before entering the vegetable plantation trail. The fog was coming in, so we pressed on. We waterproofed the kids (hehe, a garbage bag did it for Ate Raiza), and saddled up Hann on the carrier. For this leg, I was the porter (with the full pack), because I wasn't familiar with the trail (I didn't want to endanger the small one by carrying him). Ate Raiza, our friend Ralph's daughter, was a trooper. She walked all the way to the campsite without complaints (we took her small backpack midway). Hann was cooped up behind his dad, craning his neck to get a view of the action. At the campsite, both kids seemed hungry so I immediately got busy feeding them takeout McDonald's while the men set up camp. Playing inside the tent was the highlight for the kids. Some children only experience sleeping in a tent in their bedrooms, so this was a real adventure for the two. The Columbia jacket I got for Hann (another Amazon buy) was very useful in keeping him warm and dry through the night. Thank goodness the sky cleared by midnight, or else I'd be worried about squishy ground the next morning. Dawn broke and I was still living in twilight, thanks to the group socials that didn't conclude until all Tanduay bottles were upside-down. After some hot drinks and a diaper change, we set out for the summit - an easy 10-minute uphill. Some climbers were already there, basking in the morning sun. Taking the kids to the top of Cebu was both an achievement and a humbling experience. It was an achievement to bring them up there safely, but humbling at the same time because we did to show them what we love doing the most. It's no longer about who has climbed the most mountains or who's got the best equipment. Hopefully they appreciate it even at this very young age. 15 years from now, these kids will be looking back at their first climb. 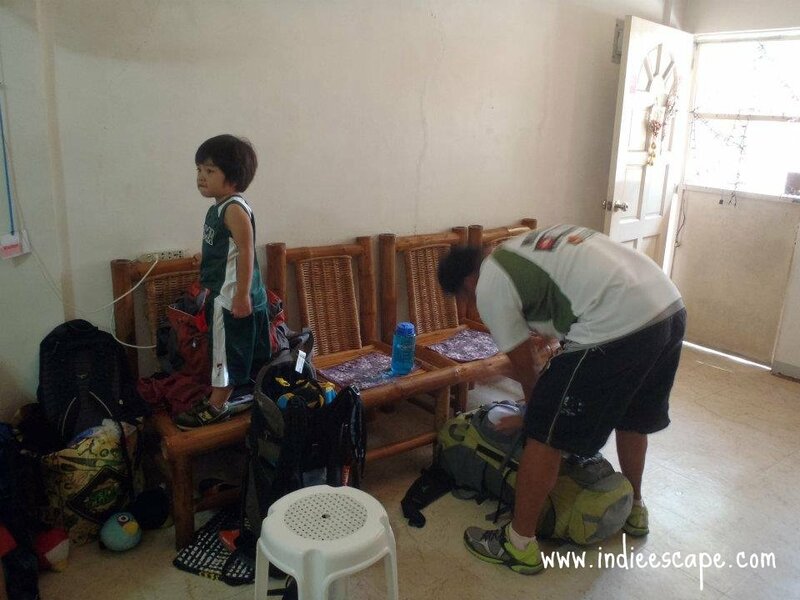 Maybe it's the lack of organized trails and camp system in the mountains that make camping with kids in the Philippines seem like a restriction. But for me, this is definitely not the last of his camping experiences. You can climb this mountain, too! Check out my Osmena Peak Itinerary. This climb took place June 2012. I've been to Cebu a lot of times already, but I haven't been to the famous Osmena Peak! Hmmm... camping is a good idea! Yeah! Kayang-kaya - for first timers and kids. Excellent view up there! 1. weather is good (rain can slow down your pace).